If you’re looking for a used car that can provide you with the money-saving fuel efficiency and eco-friendly driving you desire, the Toyota Prius is a perfect choice. 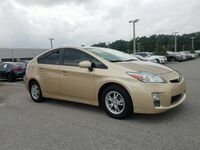 Shopping for a used Toyota Prius in Tampa, FL is easy when you have a dealership like OkCarz. To learn more about the Toyota Prius or to schedule a test drive in this hybrid, stop by OkCarz today or give us a call at one of our many locations. Keep reading to learn more about what a used Toyota Prius can offer you. The Toyota Prius is a four-door hatchback hybrid that can seat up to five passengers. It offers excellent fuel efficiency and a long list of technology features and comfort options to choose from thanks to its many available trim levels. More recent used Toyota Prius model years offer trim levels that include the One, Two, Two Eco, Three, Three Touring, Four, and Four Touring. With so many trim levels to choose from, you’ll be able to get all the features and options you want in a used hybrid. On the inside of a used Toyota Prius Hybrid, you can find an incredible list of technology features and comfort options to choose from. The Toyota Prius is available in many trim levels and model years so, you’ll have no problem finding one that offers you the features you want at a price that fits your budget. The impressive and very long list of standard features and available options offered in a used Toyota Prius in Tampa, FL can include driver and passenger favorites like a sunroof, a head-up driving display, a premium audio system, the Toyota Entune infotainment system, a touchscreen display, a driver information display, heated front seats, premium upholstery, a power driver’s seat with adjustable lumbar support, satellite radio, a wireless phone charging pad, a navigation system, a USB port, keyless entry, remote engine start, automatic climate control, and much more.